It’s a shame we don’t always have time for super special breakfasts on a weekday but there’s no reason not to have sometjing really tasty. 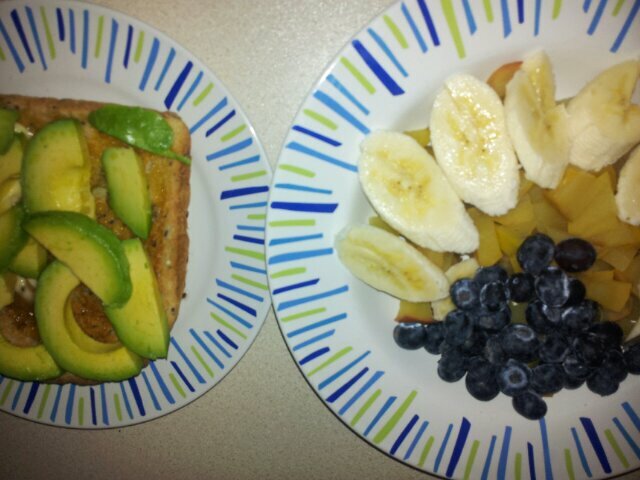 This quick breakfast was sliced avocado on seeded toast and a bowl of baked apple pieces with sliced banana and blueberries. I ‘baked’ the apple in the microwave by cutting it into bite sized pieces and zapping it for 5 minutes while I was doing the toast. The bowl had 2 whole apples in – skins and all. Super tasty and super healthy! Baked apple has continued to be a saviour during lent as it tastes so puddinh-like without the processed sugar. Talking of lent, I may have gone overboard at the weekend. No excuses: I just didn’t avoid sugar when I could have. So today (as well as yesterday) it’s back on the no-processed sugar bandwagon! Give me all of the baked apple!